Overcapacity, shortage of sustainable feedstock, blending wall… they all contribute to the increasingly challenging situation on the biodiesel market in Europe. At the same time, new HVO investments start to pop up like mushrooms after a rain. But can this be the golden mean to what is happening in the biodiesel sector right now? Is HVO really the Holy Grail of the industry? HVO, which is marketed by Neste Oil as “the highest quality diesel in the world,” stands for Hydrotreated Vegetable Oil: renewable diesel produced in the process of hydrogenation, i.e. treatment with hydrogen. As compared to regular biodiesel production by esterification, the HVO process, to put it simply, uses hydrogen and not methanol as the “catalyst.” As a result, it is not glycerin but propane that is the by-product of hydrogenation. Another important difference between the two processes is the fact that hydrogenation removes all oxygen from the vegetable oils while esterification does not. It gives an advantage to the HVO production as it helps to avoid oxidation. The main product of the HVO process is the, so called, Green Diesel. It has to be noted, though, that the HVO plant is a type of biorefinery and thus allows for production of a wide range of products from biofuels to biochemicals. Except for Green Diesel, the HVO installation can be used to produce Green Jet Fuel while Green Naptha and Green GPL, together with propane, are the by-products of the production process. The feedstock used in the process can be of the same or much lower quality than while producing the regular biodiesel but the final product is paramount or superior. The main strength points of the HVO diesel are: high cetane number, high energy density and lack of oxygen content. The key advantage of Green Diesel, however, is its CFPP level which can go down to -20°C or even -50°C irrespective of the feedstock used. This, in turn, makes HVO suitable for use during cold winters even in Nordic countries as well as for use as jet fuel. The HVO diesel is a product of exceptional quality which can be blended without limits. Thus it is a type of drop-in fuel which, theoretically, can be sold as B100 without any damage to the engines. In practice the density of B100 does not meet the EN590 density norm which, from the technical point of view, is not a problem, yet, formally the product is out of spec in this one parameter. However, it can be easily used to improve the parameters of the off spec diesel. Due to its numerous advantages over fossil diesel and regular biodiesel, HVO is gaining popularity on the European and global markets with an increasing number of companies investing in this new technology. The unquestionable leader of the world HVO market remains Neste Oil with its four state-of-the-art plants: two in Finland, one in Holland and one in Singapore. The total production capacity of Neste’s facilities is 2.4 million MT. 80% of Neste Oil’s budget for R&D, which is more than 30 million euros, is spent on research on new feedstock materials making the company an absolute pioneer on the world HVO market with its 69% market share. The main technology competitor of Neste Oil is Honeywell / UOP Green Diesel produced in the, so called, Ecofining process. This is the technology developed together with ENI and used in its refinery in Porto Marghera, Italy. The technology is jointly owned by Honeywell / UOP and ENI and thus the final product is called UOP / ENI Green Diesel. Even though the technology developed by Honeywell UOP and ENI still represents much lower percentage of the capacity installed than that of Neste, the development should be quite fast with ENI building one more refinery in Sicily. The refinery is planned to have the capacity of 500,000 MT per year. In addition, the Ecofining technology has been chosen by Petrixo Oil & Gas for their 500,000 MT per year HVO plant that will be built in the United Arab Emirates. It will be the first HVO plant in the Middle East. 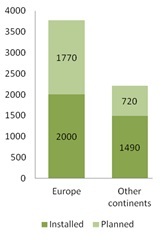 The remaining 17% of the market is divided between plants in Europe and in the US. With 460,000 MT of installed capacity, Diamond Green Diesel in Norco, Louisiana is the biggest plant of this kind in the US. It is a joint venture between Valero and Darling International. Also in Louisiana, the Renewable Energy Group is operating a plant of 230,000 MT with the technology developed by Syntroleum. In Europe, UPM, another Finnish company, developed its proprietary technology of producing what they call Bio Verno Diesel. Their plant has the capacity of 100,000 MT per year and is using tall oil as feedstock. Total, however, in its newly converted refinery in the south of France, will use the technology licensed by Axens, a French group. The process is known under the name Vegan. Several other companies have also developed their proprietary technologies for HVO production, among them ConocoPhillips, BP, PetroBras, Haldor Topsoe and Nippon Oil. However, these are either mainly used for, so called, co-processing or not really used on a large scale. Co-processing: how does it work? Part of the share of the HVO market belongs to companies doing co-processing. It is a technique allowing for HVO production using the desulfurization unit where vegetal oils are directly mixed with fossil diesel. This process is much easier to implement than pure HVO production and has also lower CAPEX. It mainly uses the Hydrogen produced on site in the fossil refining units thus limiting the sourcing needs. However, it requires the use of already refined oils which, in turns, increases the feedstock price. At the same time the HVO is already blended into the final product so it cannot be sold as pure HVO or used for improving the diesel quality by blending in higher amounts. Among the companies that already use the co-processing technique are: Total in France, Preem in Sweden, ConocoPhillips at its refinery in Ireland, Cepsa and Repsol in Spain or Galp in Portugal. Why oil majors invest in HVO? Last year’s announcement of Total about its La Mede refinery conversion to HVO as well as ENI’s plans to convert the refinery in Sicily posed a number of questions about why big oil majors invest in the new technology. The profitability of the HVO plant business model is driven by the fact that the final product of the hydrotreatment process is of higher quality than the EN14214 biodiesel standard. This is achieved with the cheapest feedstock possible such as CPO, PFAD or high FFA animal fat. In order to achieve the EU standard requirements the producers of first generation biofuels need to process a mix of vegetable oils with at least 50% of rapeseed oil while an HVO plant can run fully on palm oil or PFAD and still reach the European Union standards. A first generation plant, while using the same low quality feedstock from palm, would be able to produce biodiesel with CFPP +12°C which is out of the EU standard even in the summer. 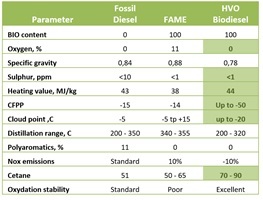 Apart from the reasons connected to the HVO’s superior quality over regular fossil diesel, the investments are also caused by financial and social reasons. Fossil oil refineries in Europe are facing overcapacity and liquidity issues which limit the profitability of the plants. Conversion to HVO allows them to become profitable and compete more successfully on the market. At the same time conversion of no-longer-profitable plants into HVO units saves thousands of workplaces by preventing closures. It results in an improved social image of these companies and gives them some political advantage. This phenomenon is especially visible in the south of Europe (ENI in Italy, Total in the south of France) while not so much in the UK, for example. This is predominantly due to higher social responsibility of the big companies in these countries and higher governmental pressures connected with the social aspect of their activities. The HVO diesel comes at quite a high price as the CAPEX of a green diesel greenfield investment is much higher than in the case of regular biodiesel plant. It is because of the expensive equipment for the hydrogenation process. To mitigate the costs, the economy of scale is of extreme importance. While CAPEX is higher in the case of an HVO plant, the same is not necessarily true for OPEX. Although the running of the plant might be costly, it is largely compensated by the price of feedstock as HVO can be produced from lowest quality waste materials which are cheap and vary from: used cooking oil, animal fat with high FFA, CPO (crude palm oil) or PFAD (Palm Fatty Acid Distillate). The technology, though, already allows for using such feedstock as: technical corn oil, PFAD, animal fat or tall oil pitch. This significantly increases the potential feedstock supplies. The by-products are much more valuable than low quality glycerin produced in the esterification process. Propane, LP or Naphtha can all be sold at higher prices mitigating, thus, the operating costs. The hydrogen consumption is also much lower than the consumption of methanol in the regular diesel production, yet, the price of methanol is lower. Due to the outstanding quality of HVO, its producers can take advantage of trading and blending opportunities. With the premium quality of their product, its low density and high centane number, it can even be used to improve the quality of diesel or regular biodiesel. The slight disadvantage of the HVO process lies in the feedstock sourcing. Although the range of feedstock used is wide, there is a long list of parameters that need to be tested. These include a detailed analysis of metals, polymers, chloride content, etc. Otherwise, there is a big risk of damages to the plant. Currently, the installed HVO capacity in Europe reaches 2 million tons with 1.6 million owned by Neste Oil, 300,000 owned by ENI in Italy and 100,000 MT operated by UPM in Finland. With Neste Oil running at 98% of its capacity in the Porvoo refinery in Finland, the actual HVO production in Europe should be around 1.5 million tons not including the co-processing plants. There are at least three new European HVO investments announced that will add the production capacity of 1,770,000 MT. This represents market growth of 88.5% within the next 3 years. The companies investing are: ENI with a plant in Sicily, Total with a plant in the south of France and Petrobras in Portugal, among others. This additional production capacity will strongly influence the demand for feedstock in Europe with the needs of producers growing by at least 1 million MT by 2018. Due to the estimated HVO production increase by 88.5% in the next 3 years and high restriction on feedstock parameters, the competition between producers of HVO and regular biodiesel to source enough feedstock will become harsher and harsher. This, in turn, will cause a rise in prices in Europe and increase the necessity to import such materials as PFAD or CPO from other continents. As a result, not only the biodiesel producers will be impacted by the increased demand for such materials but also other industries which are buyers of these types of feedstock. The additional demand for at least 1 million MT of such feedstock as PFAD or CPO will also penalize the markets of petfood and oleochemicals. Finally, these markets will be further influenced by lower glycerin supplies as it is not a by-product of the HVO process. 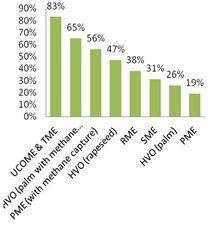 With increasing EU requirements for GHG emission savings over the next few years, it is important to mention that HVO produced from palm oil with methane capture fully complies with the required values of 35% as well as with 50% emission reduction that will be introduced in 2017. The absolute winner, however, is regular biodiesel made from UCO or animal fat with GHG emission savings of, at least, 83%. It is important to mention, though, that these are only default values while the real GHG emission savings are much higher: for RME they account for more than 50% while for UCOME, for example, can go even above 90%. With oil majors continuing to invest in their own HVO production or co-processing, they will produce their own biodiesel to fulfill the mandate and thus limit the need for external sourcing. The biodiesel producers and traders will be directly impacted as the demand for their products will be limited. As a result, the liquidity of the market will decrease. The current production of HVO represents around 9% of the biodiesel market. Yet, within the next 3 – 5 years it should double reaching 16 – 23%. 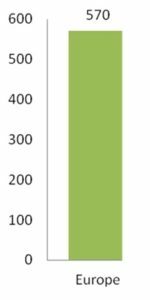 With such an exponential growth ratio of HVO investments, the key challenge for European producers of both Green Diesel and regular biodiesel will be to secure their feedstock. Fortunately, HVO plants have the advantage to produce from such materials as PFAD which can be imported in high quantities from Asia while still resulting in outstanding quality final product. By 2020, the European Union aims to have 10% of biofuels in the transport fuel of every EU country. Such a strong signal will continue to positively influence the demand of biodiesel and should make room, hopefully, for first and second generation biodiesel producers and HVO producers to live together. At the same time, HVO, due to its excellent CFPP levels, can contribute to the development of the Green Jet Fuel use on a commercial scale. Several tests have already been successfully carried out with the ratio of 50-50 with regular jet fuel. Although HVO is superior in many ways to regular biodiesel and new investments are booming, especially in Europe, it is quite unlikely to dominate the market in the near future. However, it definitely has the potential to change the way biodiesel sector looks today.